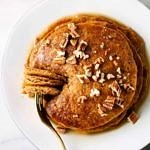 Healthy, vegan pumpkin pancakes with pumpkin puree and warm fall spices made easy. Enjoy the delicious flavors of fall! Pre-heat: Pre-heat griddle to manufacturers instructions, usually about 350 degrees for pancakes. Alternately, if using a stove-top griddle/skillet, heat over medium heat. Preheat oven to 200 degrees (for keeping pancakes warm), place cookie sheet on middle rack while oven is warming. Mix: In a medium size mixing bowl, add the flour, sugar, baking powder, and spice, mix well. Add in the pumpkin puree and non-dairy milk, mix well. Cook: Add enough oil to coat the griddle/skillet. Using a 1/4 measuring cup, scoop batter and place on griddle. Let cook about 3 minutes, edges will bubble slightly and start to look leathery, flip and cook another 3 minutes. Add oil to the griddle/skillet, and repeat until batter is gone. Place finished pancakes on a the warm cookie sheet, place in the oven to keep warm while cooking the remaining pancakes. Serve with pure maple syrup. Adding 2 tablespoons of chopped pecans over top will add protein and texture. Store leftovers in the refrigerator for up to 5 days, or keep in the freezer for up to 2 months. Reheat in the microwave or toaster oven. Makes about 8 – 6 inch pancakes, serving 3 – 4. For fluffier pancakes use only 1 cup milk, for thinner pancakes use a tad more (splash or two). For the pancakes shown here, I used a tad more milk. If using a heavy flour, such as whole wheat or oat, add a tad more milk to the batter (start with a tablespoon or two).